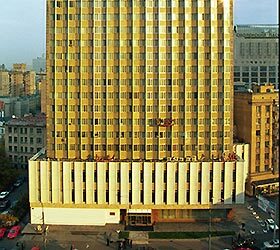 The AZIMUT Hotel Smolenskaya Moscow is a 23-storey building located in the centre of Moscow, just in 3 minutes' walk from the Smolenskaya metro station. A building of the Ministry of Foreign Affairs (MFA), Cathedral of Christ the Savior, Arbat and Novy Arbat streets, theatres, museums and restaurants are close to the hotel. Guests of the hotel are welcome to choose from 474 rooms of various categories. Each room is equipped with air conditioning, safety box, flat-screen TV, multimedia phone that functions as a charger, music player and an alarm clock, Wi-Fi, private bathroom with bathrobes, slippers and toiletries. Cafes and restaurants of various cuisine operate at the hotel. A new two-storied restaurant is located in the roof superstructure to amaze its guests with panoramic view to the city centre. The AZIMUT Hotel Smolenskaya Moscow offers 8 conference rooms equipped with modern technologies and total capacity from 45 to 360 persons. Modern panoramic fitness centre located on the 20th floor. Guest services are 24-hour front desk, parking, Wi-Fi throughout the hotel, concierge, ATM, currency exchange, dry cleaning and laundry, wake-up call, safe, room service, fax / photocopying.